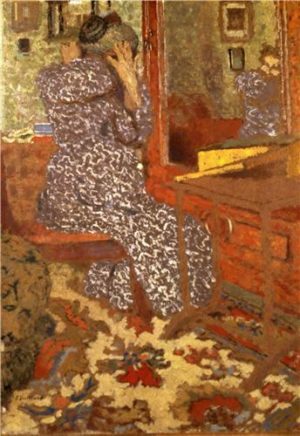 We witness a private domestic scene: the artist’s mother is posed in front of a mirror in the Parisian apartment where they lived. 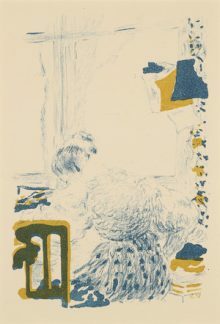 The snapshot effect here suggests that Vuillard based this painting on one of the numerous family photographs that he took. The artist’s mother ran a dressmaking business from their home and Vuillard’s style was influenced by the textiles that surrounded him. Here he combines the patterns of his mother’s dress, the carpet, bed cover and wallpaper to create a richly varied decorative surface.